This article is about the strawberry glazed donut. For the chocolate glazed donut, see Chocolate Cushion. The Sweet Dreamer (娘のおやつ?, lit. : "Girl Snack") is a treasure in Pikmin 2. 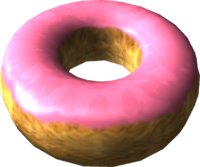 It is actually a doughnut glazed with strawberry icing, and a recolor of the Chocolate Cushion. It is found on the last (6) sublevel of the Glutton's Kitchen and is found somewhere in the area. It is subject to being taken away by Breadbugs and an even larger Giant Breadbug, so they must be dealt with if they gain possession of the item. Analysis of the Sweet Dreamer. A real world donut, glazed with strawberry icing. This page was last edited on December 11, 2018, at 13:29.